It’s the most recognizable scene from Waiting to Exhale: Angela Bassett, playing the wronged first wife Bernadine, decides to get herself some good old-fashioned revenge. Upon learning that her husband is leaving her for his white assistant, Bernadine, clad in a white dressing gown and black negligee, gathers her husband’s collection of expensive executive wear and stuffs it through the doors, windows and sunroof of his BMW. Once the walk-in closet is bare, Bernadine douses the Beemer with lighter fluid. She sets fire to the car and watches the flames for a beat before lighting a cigarette. Bernadine turns to walk back into her house and casually tosses the cigarette over her shoulder into the burning car without looking back. The entire emotional thrill ride is distilled into the flick of one cigarette: He had it coming. Which is why, more than 20 years after the movie was released, the scene lives on as internet shorthand for scorched-earth female rage. South African dancer and choreographer Dada Masilo, 33, has brought the spirit of Bernadine to the ballet, and, boy, is she cold-blooded. On Tuesday night, Masilo’s company, the Dance Factory, opened her reimagining of the classic romance Giselle at The Joyce Theater in New York. The show runs through April 8 before continuing at the Wallis Annenberg Center in Los Angeles (April 12-14) and the Quick Center in Fairfield, Connecticut (April 18). 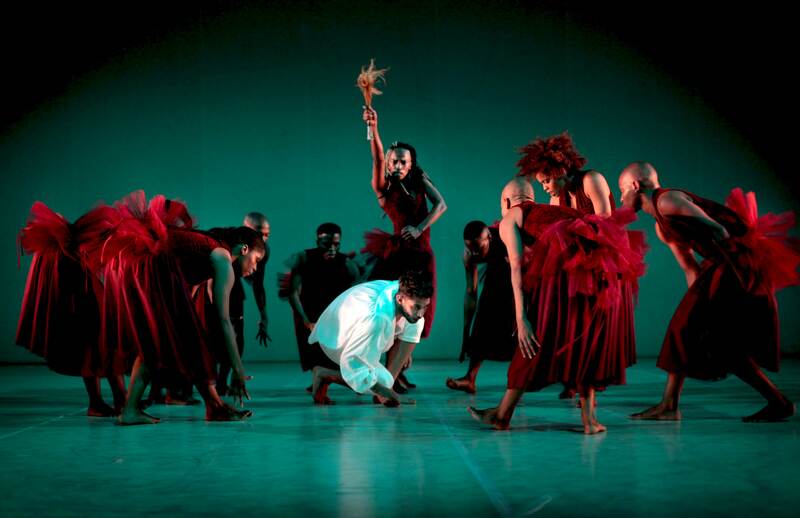 All of the dancers are black, and Masilo has choreographed a Giselle that’s a mix of ballet, modern dance and traditional South African dance. Albrecht is assaulted by the Wilis in an earlier production of “Giselle” staged in Johannesburg. For this whole Giselle-inhabits-the-spirit-of-Bernadine metaphor to make sense, you should know something about this ballet. A two-act French ballet from 1841, the work takes its name from its tragic title character. Giselle (danced by Masilo) is a peasant girl who catches the eye of a nobleman named Albrecht. Albrecht is already engaged to a noblewoman named Bathilde, but he can’t help himself. He wants Giselle, and he poses as a peasant to woo her. She falls madly in love with him. Another peasant, Hilarion, who’s also in love with Giselle, recognizes Albrecht’s deception. But she only has eyes for Albrecht. Soon enough, Albrecht’s true identity is revealed and he runs back to his noblewoman. Giselle dies of a broken heart. In Act 2, both Hilarion and Albrecht visit Giselle’s grave. This is a terrible idea, thanks to a group of angry undead spirit ladies, called the Wilis, all of whom have been betrayed in some way by their lovers. They’re sort of like graveyard Sirens: If you’re a man, you don’t really want to cross them, and if you do, they’ll force you to dance until you die. Hilarion is forced to dance to death. But Albrecht enjoys a different fate. The Wilis want Albrecht too, but thanks to the grace, love and forgiveness of Giselle, he is spared. The Wilis force Albrecht to dance until sunrise, but he lives. Albrecht gets to run back to his fiancée and remain rich. Giselle’s spirit gets to rest. Masilo has remixed the second act of Giselle to allow her title character to tap her inner Bernadine. This is Masilo’s thing. Before Giselle, she was famous for deconstructing another classical ballet. In her version of Swan Lake, not only are the dancers black, but she makes the prince gay and everyone wears tutus, including the male characters. Masilo imagined the Wilis as a coven of wronged individuals led by the sadistic Myrtha. And just like she did with her gender-bent Swan Lake, Masilo complicates things further with the addition of two male Wilis. The inclusion of male Wilis prompts questions: Are they men who have come to see things the way the women do? Are they nonbinary? Have they experienced similar romantic betrayal? Regardless, they are just as enthusiastic about forcing Hilarion (Tshepo Zasekhaya) and Albrecht (Xola Willie) to dance to their deaths. Myrtha persuades the heartbroken Giselle to see things her way, like a dungeon mistress tutoring a newly converted follower. And when Giselle allows herself to be angry with Albrecht, Myrtha gives her a whip to exact her revenge. In an earlier production in Johannesburg, Albrecht is the sole character played by a white dancer, which adds another layer of revelation. I wish they’d kept Albrecht white for the current production, but Masilo’s Giselle works perfectly well focusing on gender politics and the power of untapped feminine rage. There are plenty of dastardly men of all races. Masilo waits until the very end before she rewards us with her Bernadine moment. The Wilis exit one by one, walking into the heavenly light that beckons from stage right, until only Giselle is left with the crumpled, lifeless Albrecht. She walks across the stage to him and steps, rather unceremoniously, over Albrecht’s corpse and into the fading light. Darkness cannot drive out darkness. But Masilo’s Giselle doesn’t need her love for Albrecht to serve as her guiding light. Choosing herself will suffice.